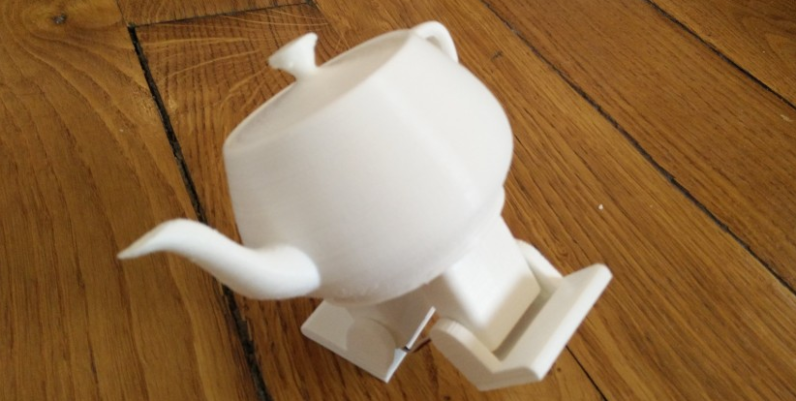 Thanks to the wonders of microcomputing and Arduino’s excellent boards, you can now build your own dancing teapot – just like the one in the children’s classic Beauty and the Beast. French computer scientist and DIY enthusiast Paul-Louis Ageneau has crafted an adorable tiny teapot that also happens to dance. To put together the two-legged mini-robot, Ageneau used 3D-modeling software OpenSCAD to design the various parts for the robot and then 3D-printed them in polylactide. You can check out and download his sketches at this GitHub repository where he has made the corresponding SCAD and STL files available. Once he had all the parts, the recreational inventor attached four servos around the ‘legs’ and ‘ankles’ of the robot and then hooked them up to an Arduino Pro Mini microcontroller board that he later programmed to dance. To power the quirky teapot, Ageneau plugged the Arduino to a 9-volt alkaline battery. The DIY robot enthusiast has since shared the code he used to make the robot dance on GitHub. In case you want to build your own dancing teapot, you can find all the necessary parts in Ageneau’s step-by-step guide here. Disclaimer: We like some products. We don’t like others. Either way, if you buy something through our affiliate links, we get a small cut of the revenue. This isn’t a sponsored post, but for the sake of transparency, you deserve to know what’s up.